When you lose someone special to you, it’s important to pay tribute to them in a way that is most fitting. Funeral letter tributes are an ideal way to do just that. 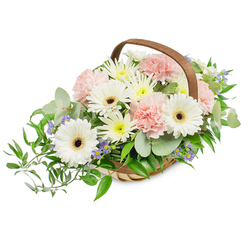 With a floral letter tribute, you can create a floral arrangement that shows the world what that person meant to you. Classic examples include ‘Mum’, ‘Dad’, ‘Grandma’ or Granddad’. But to be honest, you can create a funeral letter tribute that says anything you want it to. At Handy Flowers we have had the honour to create floral letter tributes of all kinds, so if you have an idea for what you’d like yours to say, just get in touch on 020 3409 3030 and we’ll happily discuss the options. We know that when it comes to funeral flowers for someone you care about you don’t want to have to think about cost. But the truth is that funerals are expensive, so you may have to consider where you can save some money to give your loved one the best send-off possible. And when it comes to ordering funeral flowers, Handy Flowers can help you keep the costs low. 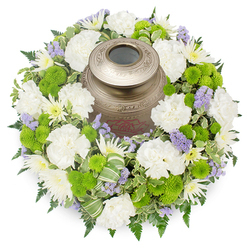 Our range of high-quality flowers for funerals is available at a truly affordable rate. We want everyone to be able to pay tribute to their loved ones in the way that feels right to them, without having to worry about their budget. So come talk to us on 020 3409 3030 to discuss our low rates, discounts, and free flower delivery. If you order a funeral letter tribute for a funeral service you may worry about how and if it will be delivered on time. We promise that when you order funeral flowers with us, you don’t have to worry about a thing. All you need to do is place your order for your funeral letters, or any other floral tribute, and tell us the details of the service. Our team will liaise with the funeral home to organise your funeral flower delivery for you. 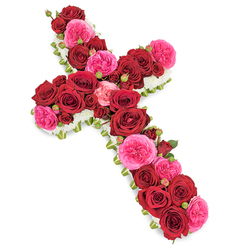 Whether that is to the home so that your floral letter tribute can travel in the hearse to the service or directly to the ceremony site, we will handle everything for you. When faced with a decision about funeral flowers it can seem overwhelming at first. There are so many options to choose from and for many people, it can simply add stress to an already distressing time. At Handy Flowers we understand how hard this time can be, so we are here to do whatever we can to ease the stress for you. To help, our florists are always on hand to offer advice and guidance on choosing flowers and can arrange to send funeral flowers for you to anywhere in London. So if you have questions or concerns, please just ask. If you are unsure about what funeral letters to order for your loved one’s service, you can always ask our florists for advice and support. We have been involved in many funerals over the years and can always advise on top options for your needs. Our team will work with you to choose the perfect funeral tribute depending on your budget, and yours and your loved one’s preferences. Together we can design funeral letter tributes that will really show the world just how much you cared for that person, and how much you are going to miss them. Our florists have plenty of experience, so they are always happy to help. There are certain things you need to be able to rely on in life, and we believe that funeral flower delivery is one of these things. 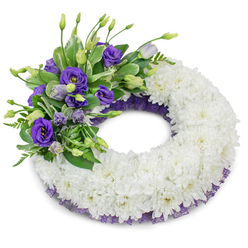 With so much to worry about and organise in this time of grief, you do not want to have to worry about whether you’ll have your funeral flowers delivered on time or not. But with Handy Flowers we promise you will never need to worry. When you order flowers with us you are in good hands. Depending on your preference we can keep you updated on the progress of your order. Or if you’d rather be left alone at this time, trust us to get the job done for you without any fuss or worry. 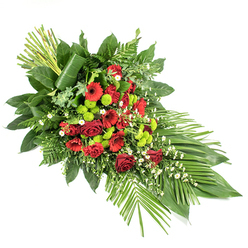 If you need to send funeral flowers, then we are the best way to do it. 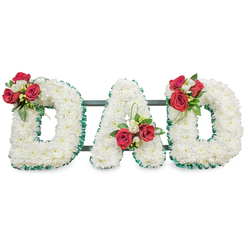 Not only can we handcraft a unique and fitting funeral letter tribute for your loved one, but we can arrange to send funeral flowers anywhere they need to go. Whether it’s the local church down the street or to a completely different area miles away. 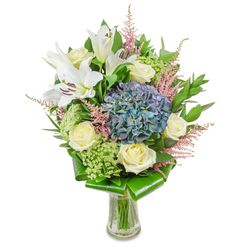 All you need to do is tell us what flowers you’d like and where we need to send them. Then our expert couriers will make it happen. No worry for you and we guarantee your flowers will always arrive as planned. When it comes to funeral flowers we believe that only the very best will do for our customers and their loved one. At Handy Flowers we use the freshest blooms we can get our hands on and using the latest florist techniques we can create bespoke, handcrafted funeral letter tributes, casket sprays and so much more just for you. Our funeral flowers are designed to last so whether you wish to leave them at your loved one’s burial site or take them home as a reminder of that person, your chosen bouquet will last longer than average for you to enjoy wherever they are. Order flower delivery from the best!